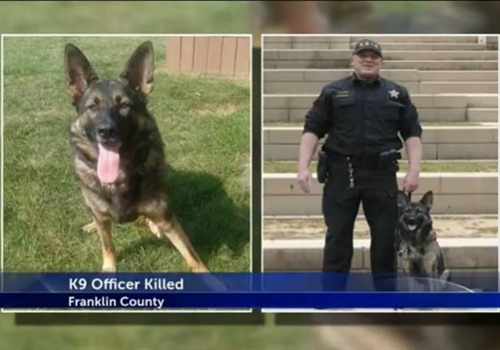 A Franklin County (OH) Sheriff's Department dog was killed Monday morning when she suddenly darted into the street and was struck by a truck, reports WCMH-TV. Udet, a 3-year-old German Shepherd, was trained in narcotics detection and worked with Deputy Mike Durbin. Chief Deputy Jim Gilbert told NBC4 that Durbin and Udet were preparing to leave for work in the morning when Udet spotted another dog across the street and took off. Gilbert says Durbin tried to recall Udet but she did not respond and was struck by a dump truck. Gilbert says Udet was Durbin's second K-9 partner. "It's a very tough time, very emotional time right now," Gilbert said. "He's energetic. He loves the job that he does with the dog and that bond that's forged. This is going to be very tough for him." Udet will be buried at the Franklin County Canine Memorial on Jackson Pike.